And it's the same all over the world, with their own local versions of the same things. 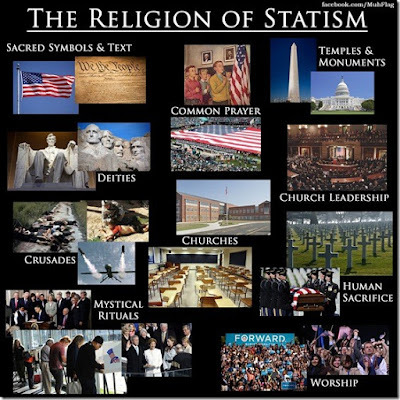 Statism, the belief that "government" is a legitimate human endeavor, is a religion. The most widespread human religion of all. It is a matter of faith to its followers and questioning the precepts is seen as an act of war. Those outside the religion see it for the ridiculous and harmful myth it really is. The statist's god, or one of them, is the State. It is not an exclusive religion since you can belong to other religions as well. Most other religions are no real threat since they reinforce Statism rather than challenging it, ignoring the fact that the State requires you have no gods above it. Statism makes the claim that since the State makes the rules- defines the "sins", if you will- the State can do things that would be evil if done by you or me, yet maintain its holiness in the eyes of its followers. While individual priests of Statism (politicians and state apologists) can sin, the State as a concept remains unquestioned, as does its sacredness. Since the State writes the Commandments, the State exempts itself as being above them. The State forbids you to murder, but the State can murder many orders of magnitude more victims than Ted Bundy did. And the statists approve. The State forbids you to kidnap, but the State can kidnap, especially those who dare to reject the religion. Once again, the statists cheer. The State forbids you to steal, but the State can steal, and kidnap or murder you if you resist. And the statists insist you must cooperate and enthusiastically blame you for your own destruction if you do not. The State can do just about anything as long as the State makes the required adjustments to its followers' morality first. It does this by passing "laws". As long as State actions have been "legalized" by the State, they are assumed to be "right" by those who don't see through the smoke and mirrors. As long as the State gets to decide whether its own actions are wrong, its actions will be judged, by itself, as "just". I am glad to be an "astatist". And, in Albuquerque news, a sheriff's deputy shot and killed a man who was supposedly threatening suicide. Suicide is a right, although an unpopular one. For LEOs to intervene, and then decide he is a "deadly threat" to the deputies (who are where they have no right to be) and kill the "suicidal" object of their unwanted attention, is twisted and wrong. The person who called the LEOs should be ashamed, but obviously being a follower of the Statist religion, the person is probably proud of himself for doing "the right thing". The priests of Statism will agree.